I charge £45 for a standard sweep in most areas. Please call for a quote on any of the other services I offer such as Chimney Lining, fitting pots and guards, removal of birdsnest etc. Other prices on request for taller properties / inglenooks / unlined wood/multi fuel stoves. In most cases it’s £45 anyway. Discounts available for multiple sweeps in the same property or if you book a nieghbour on the same day. 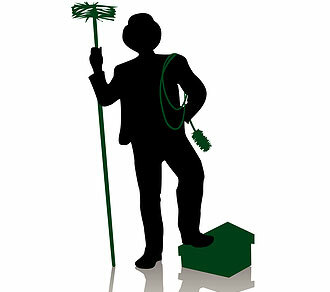 Can a Derby Chimney Sweep Help Prevent Water Damage? It’s pretty safe to say that if you have a chimney, you want to keep it in good condition. But did you know that one of the biggest problems with maintaining your chimney is avoiding and preventing water damage? The most inexpensive – and probably most effective – method of preventing water damage to your chimney is through the use of a chimney cap. Also called rain covers, they have been known to be highly important parts of keeping your chimney in fit form for many years. So how do they work? In its most basic description, a chimney cap works by channelling large amounts of rain or snow to prevent it from getting between the stonework which, as any Derby chimney sweep will tell you, can cause the freeze/thaw cycle effect – something that can severely damage your chimney stack. Not only do they help prevent water damage though, but they can help to stop pests such as birds and small animals from taking up residence in your chimney – something you don’t want when you’re about to light a fire! Will my Derby chimney sweep fit the cap for me? Not only will your chimney sweep be able to fit the cap, but they will be able to install it so it is easy to remove for cleaning purposes at a later date. A professional chimney sweep in Derby should fit a sturdy and durable cap, usually made of corrosion resistant material. This helps ensure that the lifetime of your cap is extended to its maximum possible length and ensures that you don’t have to buy a replacement any time soon. How Much is a Chimney Cap? The cost of a chimney cap varies depending on what exactly you want. If you’re a little tight on cash, you can have your Derby chimney sweep install a cap that provides partial coverage – coverage that protects against most water damage. It’s recommended however (if your budget allows) that you have a full sized chimney cap installed to protect your entire stack – in the long run, it will make you valuable savings in terms of chimney repair! So if you want to keep your Derby chimney in good nick, get in touch with a professional chimney sweep who will be able to take care of the professional installation.